Jenna, who lives in a small Southern town, works at Joe’s Diner, and is bullied into turning over her tip money by her abusive husband, is far better at creating irresistible pies than she is at choosing men. 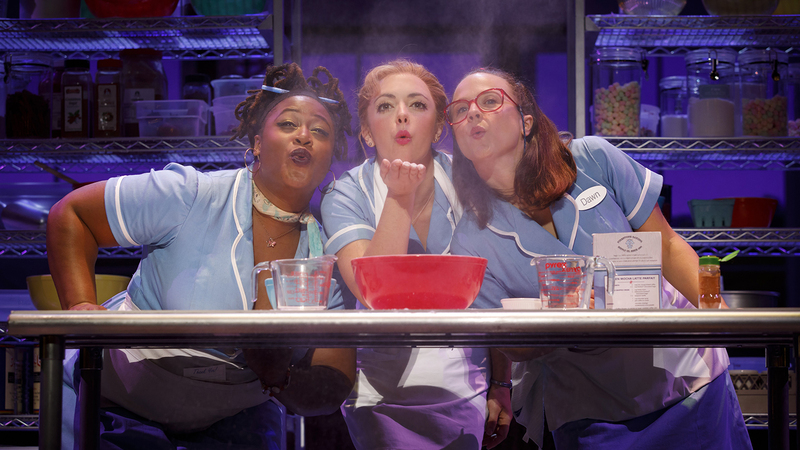 That becomes abundantly clear early on in “Waitress,” the musical with a richly layered and varied score by singer-songwriter Sara Bareilles, a broad, comedy-laced book by Jessie Nelson (based on Adrienne Shelly’s popular 2007 film), and a message about both self-liberation and the quest for love that is at once retro-feminist and tempered by the arrival of the #MeToo era. The show, which opened on Broadway in 2016 (where it is still running), and is now in a national touring production, has its tragicomic charms. But Chicago’s Cadillac Palace Theatre is far too big a venue for this essentially intimate story. And while the musical features a fine onstage band and exuberant cast, the overall sound system for the show is notably unbalanced, resulting in both the song lyrics and dialogue often being blurred or indecipherable. Flour, butter, sugar: The essential ingredients for any pie crust. But then, if you are Jenna (Desi Oakley), a waitress and pie maker, you fill it with dreams – hoping to win a good sum of prize money in a pie contest so that you can free yourself from Earl (Nick Bailey), your low-life husband, and finally leave town. But those dreams are thwarted when Jenna learns she is pregnant, and she begins to think she might end up repeating all that went wrong in her mother’s life, spent with the wrong man. And then comes a wholly unexpected affair with Dr. Pomatter (Bryan Fenkart), a nerdy (and married) obstetrician. As much as it complicates matters, it gives Jenna a newfound sense of confidence, even if it is far from a rescue fantasy. Meanwhile, all along the way, Jenna gets support from her fellow waitresses at the diner: Becky (Charity Angel Dawson), the boisterous spirit who cares for her ailing, aging husband and engages in a love-hate relationship with Cal (Ryan G. Dunkin), the diner’s irritable cook, and Dawn (Lenne Klingaman), the naive and anxious eccentric in search of an adoring mate, who just happens to find Ogie (Jeremy Morse), a guy whose eccentricities could not be more perfectly aligned with her own. Last but by no means least there is Joe (Larry Marshall), the cranky, elderly, oft-divorced owner of the diner who has a sweet spot in his heart for his favorite waitress. Will the medical office affair (which raises a comic eyebrow from Pomatter’s nurse, deftly played by Maiesha McQueen) set Jenna free? Or will the arrival of the baby she doesn’t really want turn out to be the most surprising love of all? Diane Paulus is never the most subtle director, but along with choreographer Lorin Latarro (who has clearly taken her cue from Steven Hoggett), she has tapped into the pain and high comedy of the story. And Scott Pask’s set moves sleekly from diner, to bus stop, to doctor’s office, with the band, led by Jenny Cartney, often a visible part of the action. Some in the audience of this happily self-mocking show might appreciate Cal’s quip about “estrogen asphyxiation.” But chances are the unanimous response will be the desire to find a diner and order a nice big slice of pie. “Waitress” runs through July 22 at the Cadillac Palace Theatre, 151 W. Randolph St. For tickets ($27-$105), call (800) 775-2000 or visit www.BroadwayInChicago.com.